It was scaring walking close to the cliff of the Kamuiwakka Creek. I looked down the creek and saw hot springs. 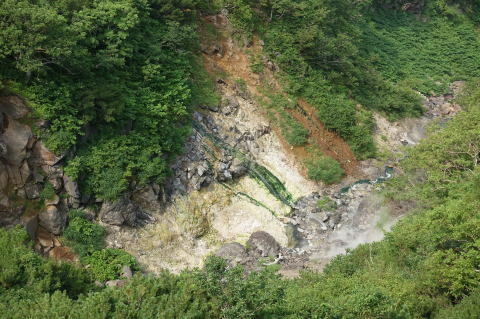 The green streak at the center of this photograph is Green Hot Spring. The green color is due to micro bacteria living in the acid hot spring water. Across the stream is Yellow Hot Spring, much hotter than the Green. Two years ago I climbed down the cliff with a rope and bathed there after working on the geology.